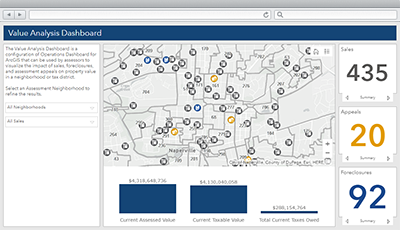 The Value Analysis Dashboard is a configuration of Operations Dashboard for ArcGIS that can be used by assessors to visualize the impact of sales, foreclosures, and assessment appeals on property value in a neighborhood or tax district. The dashboard offers a map-based view of key operational layers from assessment and tax business systems, and provides a high-level view into changes in property assessments and tax revenue within a local government. To deploy Value Analysis Dashboard with the ArcGIS Solutions Deployment Tool requires specific software. Application Value Analysis Dashboard An application that can be used by assessors to visualize the impact of sales, foreclosures, and assessment appeals on property value in a neighborhood or tax district. Map Value Analysis Dashboard A map used in the Value Analysis Dashboard application to visualize the impact of sales, foreclosures, and assessment appeals on property value in a neighborhood or tax district. Feature layers TaxParcelAppeals A feature layer used to store to monitor assessment appeals filed by property owners and heard by the Board of Review. TaxParcelValueReports A public feature layer view used to monitor year over year value changes aggregated by assessment neighborhood. TaxParcelForeclosures A feature layer view used to store Sheriff Deeds recorded in the Register of Deeds Office and typically used to indicate parcels that are in a foreclosure process. Tax Parcels A feature layer used to store divisions of land for the sole purpose of equitable taxation, combined with assessing and tax information from CAMA and Tax systems. TaxParcelSales A feature layer used to store qualified sales, or a legally binding agreement between two parties, that results in the purchase or transfer of real property. TaxParcels_dashboard A feature layer view used in the Value Analysis Dashboard to monitor divisions of land for the sole purpose of equitable taxation, combined with assessing and tax information from CAMA and Tax systems. TaxParcelAppeals_dashboard A feature layer used to store to monitor assessment appeals filed by property owners and heard by the Board of Review. TaxParcelValueReports_dashboard A public feature layer view used to monitor year over year value changes aggregated by assessment neighborhood. TaxParcelForeclosures_dashboard A public feature layer view used to store Sheriff Deeds recorded in the Register of Deeds Office and typically used to indicate parcels that are in a foreclosure process. TaxParcelSales_dashboard A public view of qualified sales, or a legally binding agreement between two parties, that results in the purchase or transfer of real property. Below are the release dates and notes for Value Analysis Dashboard. First release of Value Analysis Dashboard using Operations Dashboard for ArcGIS configurable web app.